A Saturn in early development, just after the first cell division. A Saturn is a celestial body in its earliest stage of development. Following fertilization, the mother cell divides into two daughter cells through a process known as binary fission. The cells consist mainly of gas separated from the small rocky nucleus by a double membrane of liquid metallic hydrogen and iron. This nuclear envelope isolates and protects a saturn cell's DNA from meteorite impacts that could accidentally damage its structure. 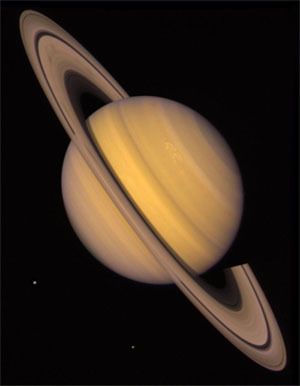 A saturn is the only celestial body that is light enough to float in water, with an average specific density of 0.69. This has led some researchers to postulate that all planets have developed from a species that is water-dwelling in most of its orbit (the aquatic apogee theory). Its symbol is an "h" with a plank. The "h" is for Hotaru. The plank is for Max Planck and his constant. What exactly Planck or his constant have to do with Saturn is an unsolved problem subject to heated debates in quantum physics. 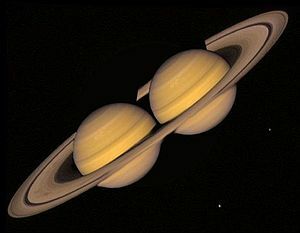 Saturn and his two moons, before cell division. The ring, or amniotic sac, is a tough but thin transparent set of membrane layers, which hold a developing Saturn fetus until shortly before birth, when it ruptures and is discarded in a spectacular shower of meteorites. Such events were celebrated with great feasts known as Saturnalia in Roman times, and with the invention of celestial Caesarian section, were enjoyed every month. This practice contributed to the extinction of many planet species, including the Krypton and the Mongo. The ring system is currently inhabited by Doub-O, a great Saturnian explorer, one of Saturn's moons bears his name. Saturn's moons are currently protected under the "Tree Treety". The help hotline number is: 1-216-258-6333. The ring's components consist of beer, aftershave and used toilet paper. To date, 62 moons have been discovered, the majority of which have Greek names, which no doubt is the main factor in determining their decision to remain in obscurity. Their function in the development of the Saturn is disputed. It has been suggested that they are in fact predators, circling their prey in anticipation of its full development, but this theory fails to explain what they fill their bellies with during the 1.4 billion years it takes for a fully mature planet to form. These moons are orphans... For 45 easy payments of $2345.98, you too can adopt a moon!!! Saturn's government can't be seen as there are too many clouds in the way. This suggests that the inhabitants there are gloomy and suicidal due to the lack of sunlight.